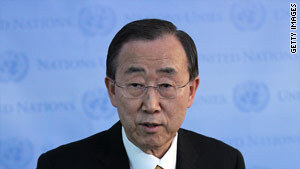 U.N. Secretary-General Ban Ki-moon called for a focus on social responsibility at the Global Compact Leaders Summit. United Nations (CNN) -- Leaders in commerce who met Thursday at the United Nations say they expect a significant shift in global business practices that focus on social responsibility. "Principles and profits go hand in hand," U.N. Secretary-General Ban Ki-moon told the Global Compact Leaders Summit in urging international business executives to recommit to social responsibility. The U.N. Global Compact seeks to uphold human rights, labor and environmental standards, as well as anti-corruption in business practices. Ban said he expects the conference to "usher in a new era" for achieving these goals. Accenture executive Mark Foster said that a "fundamental shift" is already under way. Business leaders are increasingly aware that "what is good for society, is also good for business," he said. Foster presented to the conference a CEO study on sustainability -- a joint effort of the Global Compact and his company. The study reports that 91 percent of CEOs say they would use new technology within five years to pursue socially responsible business practices. In addition, 80 percent of CEOs expect that standards similar to the Global Compact goals will play a part in "company strategies and operations" over the next 10 to 15 years, the study found. Ban pressed leaders for more investment in developing countries and said that he hopes for a "truly transformative movement." His aim for the Global Compact is to increase its participants from more than 8,000 at present to 20,000 participants by 2020.